I keep mentioning the use of the LAB Color mode. And rather than take away from posting in the critique gallery, I though it best to write something up here. Now, I am NOT a PS expert and frankly have very little understanding of how most of this stuff works. I’m a user of the tool and have found some helpful things over the years (ie. Thank You Tony Kuyper!) 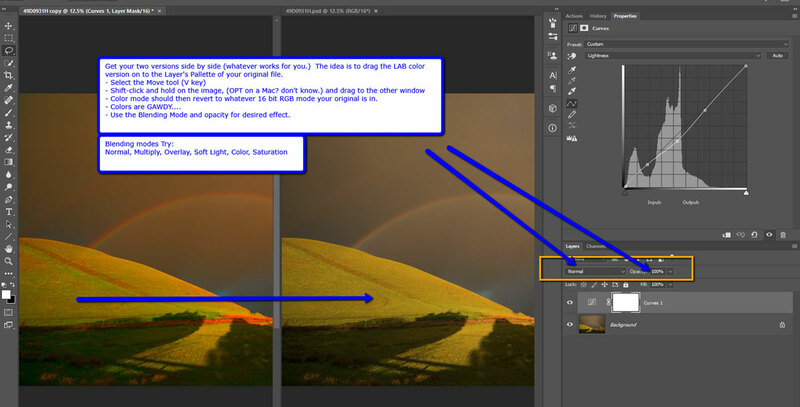 I don’t remember where I picked this up, but you can find lots of videos if you google for “Using LAB Color mode to enhance your photos” or some similar search. In summary, LAB mode allows you to alter the lightness of colors without affecting their color values - I think. Much like one can do using a b&w adj layer in Luminosity mode. By changing the Mode to LAB (Lightness, A, B channels) and using a Curves layer, you can adjust the colors, ie. concentrating the colors in to a smaller space, ie. 0-255 down to 0-126 or something like that. I think I’m pretending here so I’ll stop and get to the process. Duplicate your original, then flatten the duplicate. You can do this at any point during your processing. I don’t know pros/cons, experiment. select the A channel and adjust the dark and light end points (actually that would be the red and green end pts.} Drag them towards the center curve. Make sure you move an equal amount on both sides or you introduce a new color cast. repeat for the B Channel. Now, the farther you move the sliders, the more extreme the effect. This is ok because we will be changing blending mode later. Alternatively, you can actually use this in a more subtle way to effect color change without changing blending more or opacity later. Once done with adjustments, again the image will look hideous, flatten this duplicated layer. 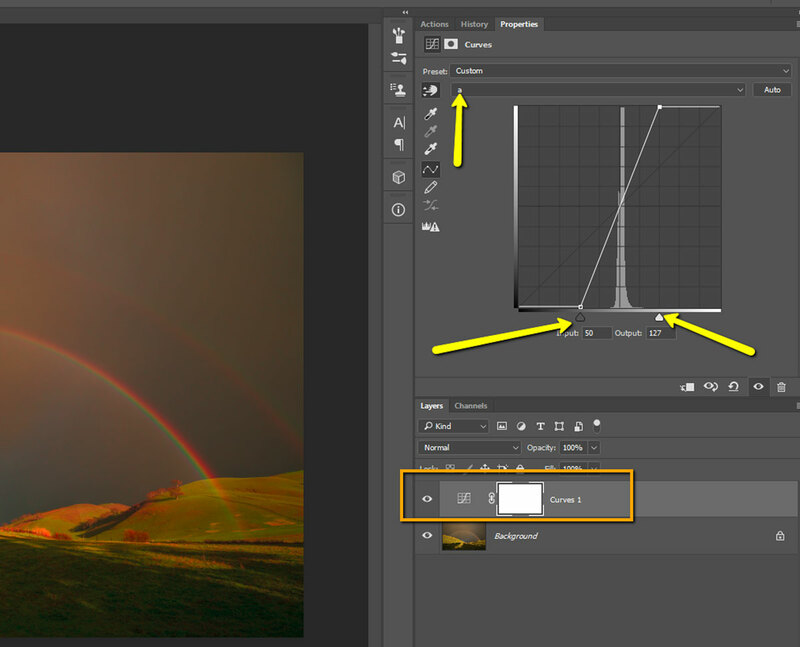 Once on the layer stack, change blending mode and opacity to suit your needs, taste. Tip: I created an ACTION to duplicate, add the Curves layer and set the points. Of course not every image needs this, nor should you blindly use on every image. I think it’s similar to the Orton effect in that it can be used effectively, but also easily over done. Honestly, I don’t know if this falls in to the realm of “do no harm to your pixels…” or not. I do understand that if you go back and for between color modes too often there could be degradation. So here, there’s only one mode change, so I think ok. Thanks for putting this together, Lon. I appreciate the effort. Actually I’ve been using LAB judiciously for over a year when you first made mention of it at the old NPN. Have you ever used other adjustments in LAB mode? I noticed that the HSL adjustments in LAB mode were different than RGB. The color intensity seems to be greater so I explored that for a while. I haven’t gone beyond that, however. Virtually every tutorial and book talks about only the curve adjustment in LAB. I too have the book John mentions but have found it to be virtually unreadable. 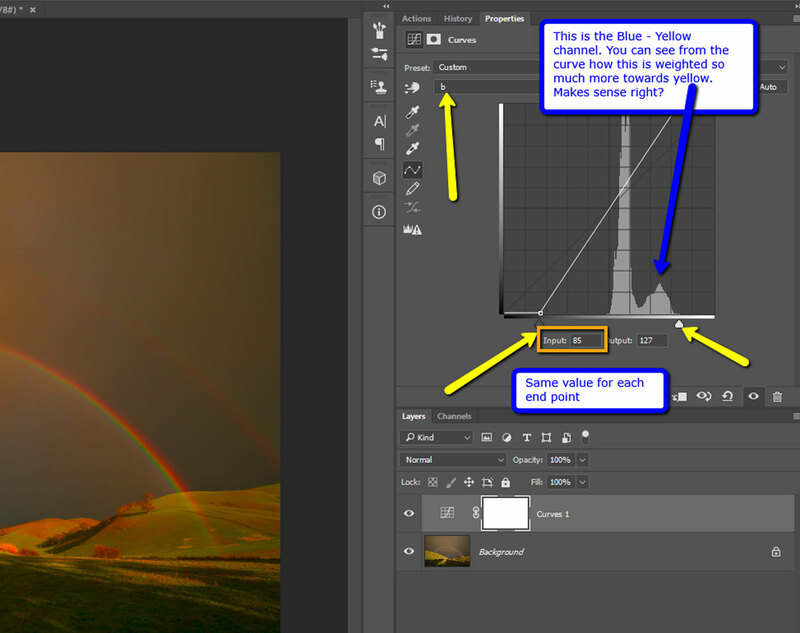 I just tried this method and it seems to be a controlled way of adding natural vibrance. I like how you can balance where saturation is applied. Ie in the warm or cool tones. It seems to use a different algorithm then the hsl sliders in RGB mode. I recall liking it a lot at the time but not much else about it, and no idea how it compares to the habits I’ve fallen into today. Time to revisit the tutorial for comparisons, I’m sure. It’s in the member-only portion to the site, so I won’t bother posting a link. Thanks for the useful and greatly appreciated nudge back into LAB, Lon. Your action looks compelling.